Donald Trump has officially embarked on his first big overseas trip abroad as President of the USA -- checking in on three major world religions. He's starting off in Saudi Arabia by giving a speech to all the Muslims on how to better practice their faith. Then it's off to Israel to talk about how Jared Kushner can solve all of their problems. God only knows what kind of offense he has planned for the Vatican. 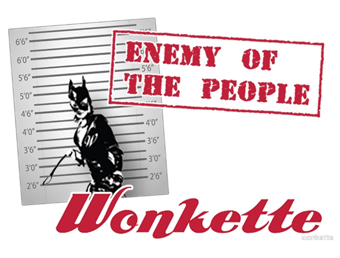 It seems certain that, when all is said and done, we will all intone, solemnly, That Could Have Gone Better. 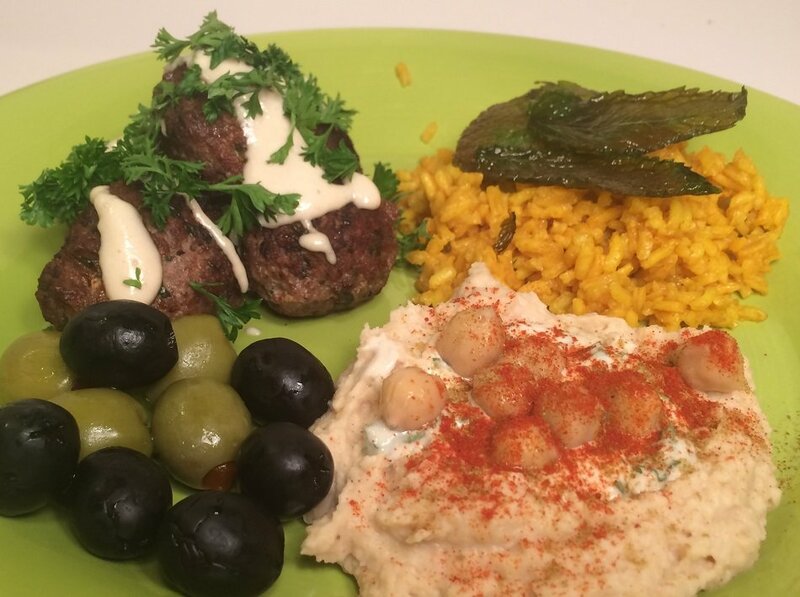 Ketzitzot w/ Tahina Sauce (Israeli Meatballs), Turmeric Rice w/Fried Mint Leaves, Hummus Masabacha, Pita Bread and Olives. Add a salad, and you've got a pretty good meal! There's a lot to do, so let's get to work! Hummus first, as it will only be helped by some time for the flavors to marry, then the rice, since it needs no attention while it cooks, and will be fine if it sits for a few minutes, if necessary, while we finish up the meatballs. 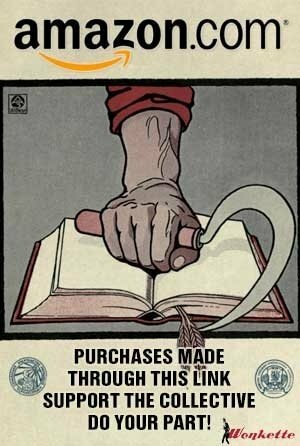 WHAT TO DO WITH WHAT YOU NEED! In a medium bowl, cover the dried chickpeas with 2 inches of water and stir in the baking soda. The preceding steps don't apply if using canned chickpeas. In a medium saucepan, cover the chickpeas with 2 inches of fresh water. Add the garlic cloves and bring to a boil. Reduce heat to medium low, simmer until the chickpeas are tender, about 40 minutes. 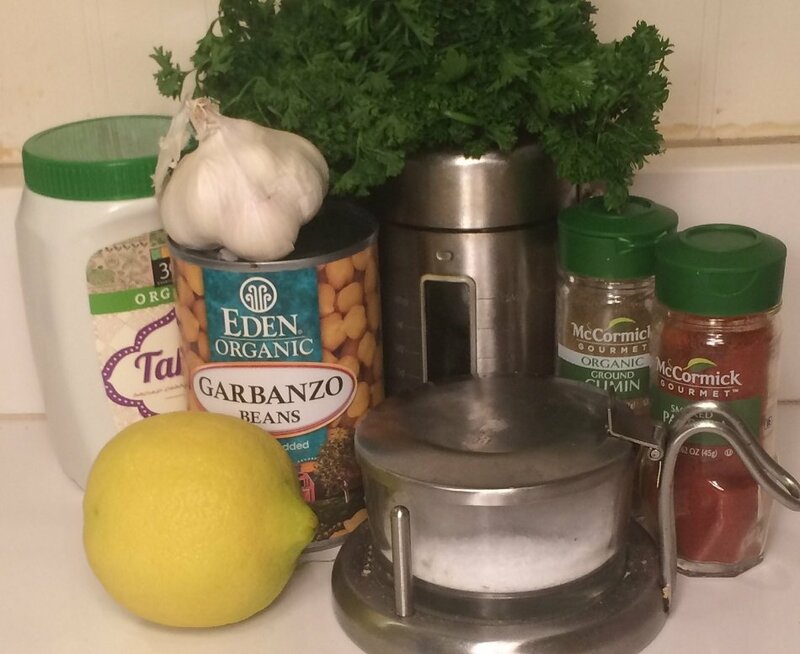 Drain, reserving 10 tablespoons of the cooking water and 2 tablespoons of the chickpeas. Rinse the chickpeas under cold water. Peel the garlic cloves. In a food processor, puree the chickpeas with ½ cup of the reserved cooking water, 1/4 cup of the olive oil and 6 of the garlic cloves. Add the cumin along with 1/4 cup each of the tahini and lemon juice and process until creamy. Season the hummus with salt and transfer to a serving bowl. Wipe out the food processor. Add the remaining ¼ cup of tahini, 1/4 cup of olive oil, 2 tablespoons of reserved cooking water, 1 tablespoon of lemon juice and garlic clove and puree. Using a ladle, make an indent in the center of the hummus. Spoon in the tahini-lemon mixture. Sprinkle the hummus with the cumin and paprika. 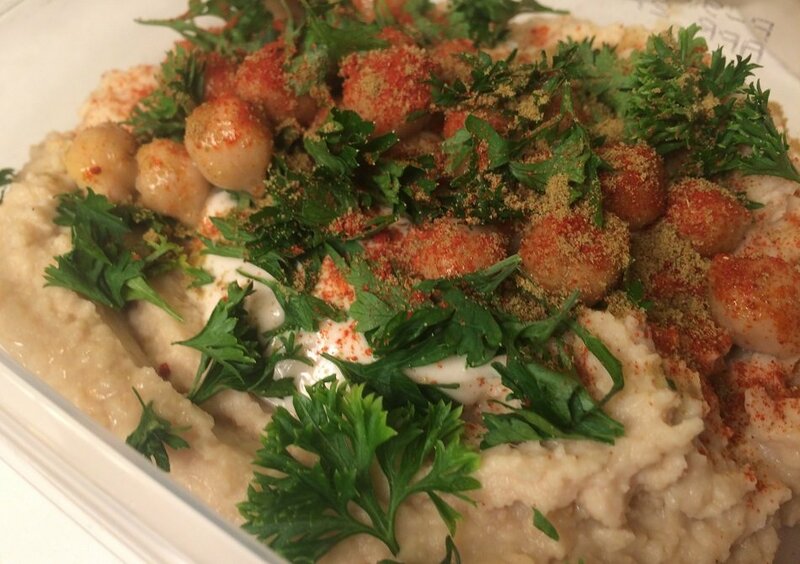 Garnish with the reserved whole chickpeas and the parsley, and serve with pita bread. Eating yellow snow: no. Yellow rice? 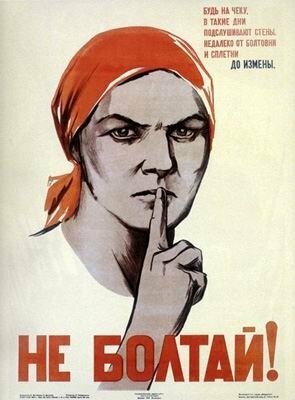 Very yes! 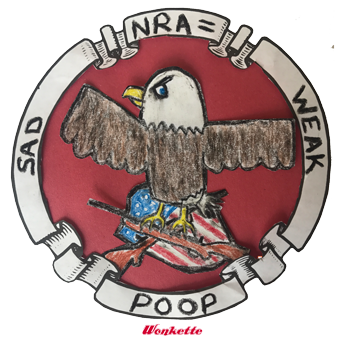 Not much to it, really. 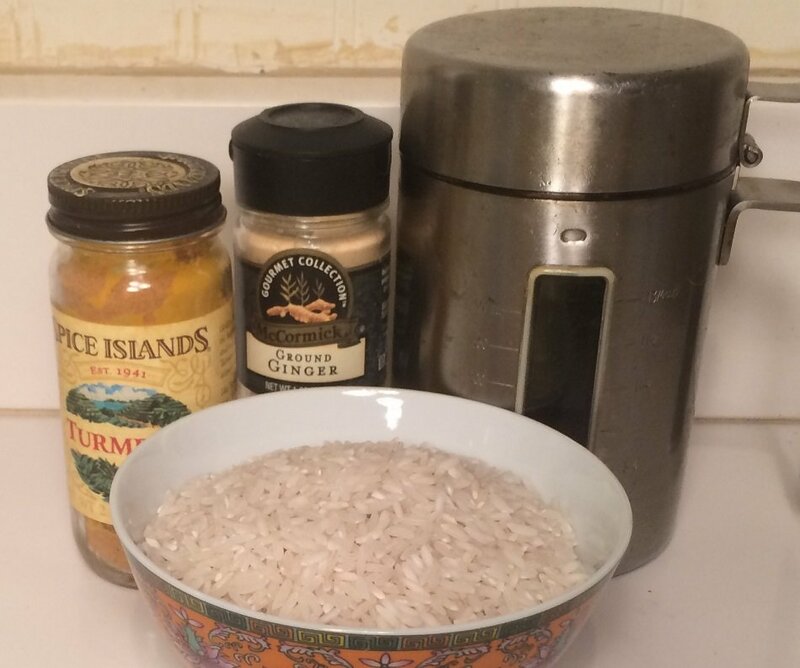 Follow instructions for the rice you are using, substituting stock for water. When time to add rice, also add all other ingredients in list. Heat the coconut oil in a small saucepan and place the mint leaves in the hot oil. Fry for 2 minutes on each side until crispy. 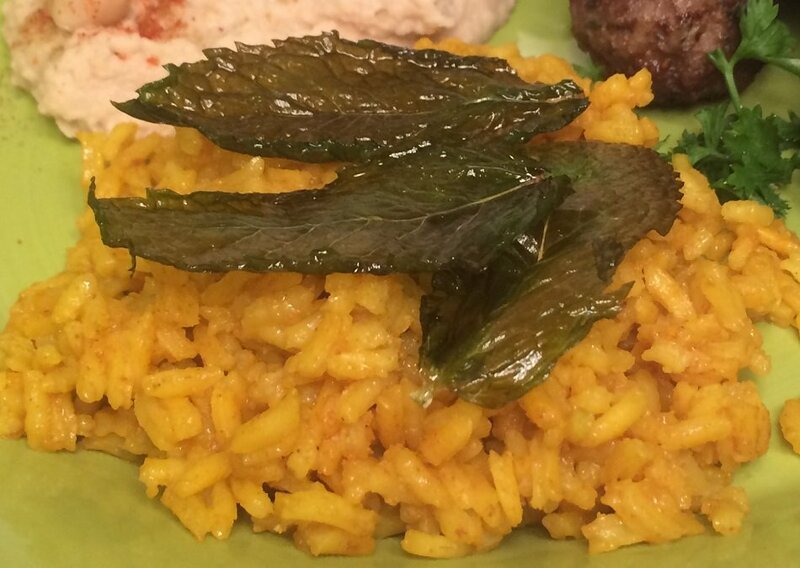 Top the turmeric rice with the fried mint leaves and serve. Combine all ingredients for meatballs and then shape into oval balls. Heat a few tablespoons of vegetable oil in a frying pan. Fry on high until firm and golden brown. Flip frequently to cook evenly. 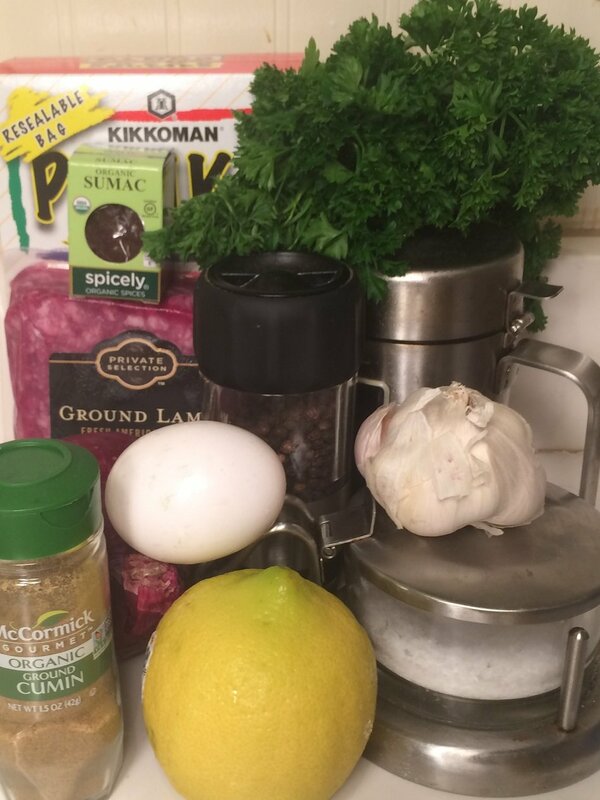 Put all the tahini ingredients except for the parsley in the food processor and process until smooth. Thin with water if necessary. Add in the roughly chopped parsley after processing. 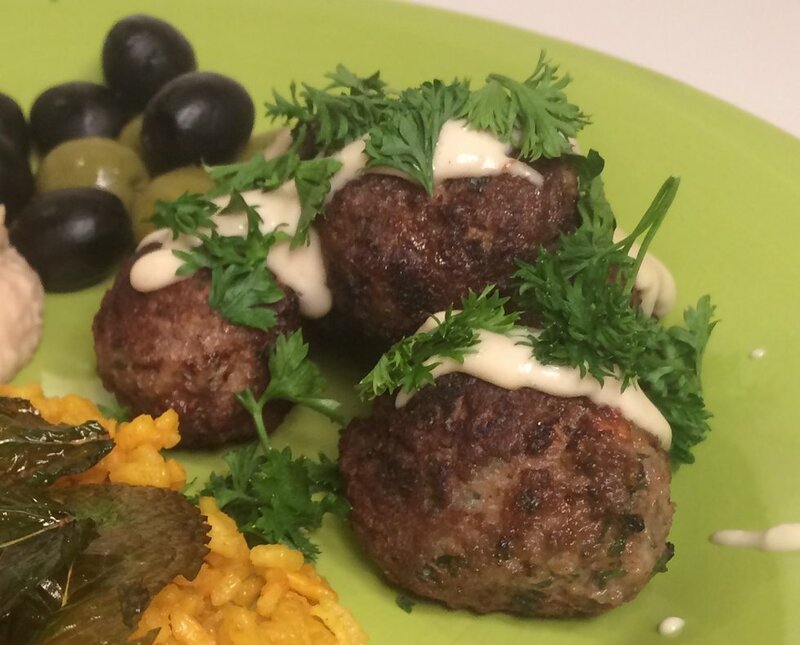 Plate the meatballs, then drizzle with tahini. Garnish with additional parsley. This was magical. The three dishes, with olives for palate cleansing, partnered perfectly. The rice was light and bright, the fragile, flaky mint leaves adding a delightful sweetness; the Hummus bringing an earthy note, kept from being too weighty by the Tahini and copious amounts of parsley; the delicately textured Ketzitzot anchoring the plate with its rich meatiness. This plate is all about subtlety. While the air in the kitchen is redolent with rich spices as it cooks, the actual dishes are quite delicately flavored, encouraging the diner to savor every bite and relish the way the dishes complement one another. Make this. You'll be glad you did. 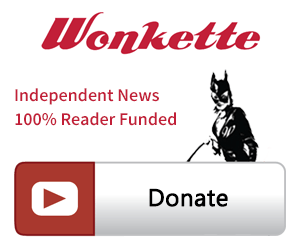 And when you're done... please donate to your favorite ad-free, reader supported site, Wonkette!